I have one to sell please email mail for price. Chairman Mao with First Secretary of the Party of Labor of Albania His name was Enver Hoxha. 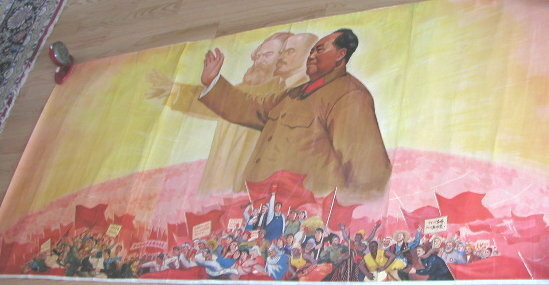 3 Panel propaganda poster from the Cultural Revolution circa 1970, its design showing crowds of people holding Little Red Books following the tenets of Mao. Dominating the horizon are bold images of the Chairman alongside the spirits of Lenin and Karl Marx – in homage to the proletariat of the world as they rise up in revolution. This 3 panel poster is majestic in its balance and energy.